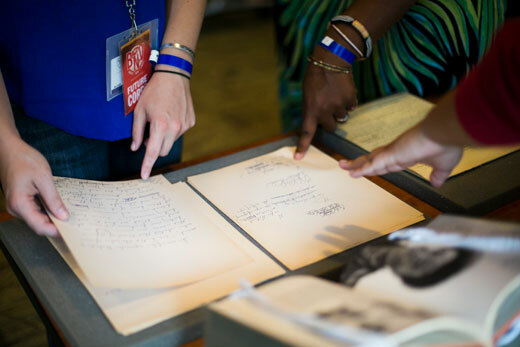 Poets on campus for the 2015 Brave New Voices International Youth Poetry Slam Festival explore MARBL archival materials, including early poems and hand-corrected drafts of work by acclaimed poets Langston Hughes, Seamus Heaney and Lucille Clifton. 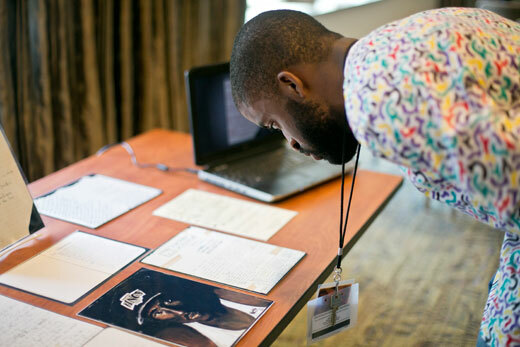 Onyirimba, from Norfolk, Virginia, studies archival materials reflecting the life's work of rapper and poet Tupac Amaru Shakur, provided by Atlanta University Center's Robert W. Woodruff Library Archives Research Center. Young poets from across the country are granted an intimate glimpse into the working lives of some of the top poets of the 20th century through an exhibit of MARBL materials reflecting themes of poetry and protest. 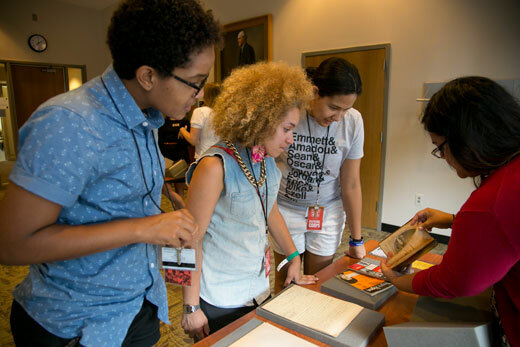 Poets of the past and present mingled last week at Emory’s Manuscript, Archives and Rare Book Library (MARBL), as young people on campus for the 18th annual Brave New Voices International Youth Poetry Slam Festival explored archival materials representing poets ranging from Langston Hughes to Tupac Amaru Shakur. As part of the four-day festival of workshops, poetry performance and competition — much of which took place on campus — MARBL staff hosted an event July 16 in the Jones Room of Emory’s Woodruff Library that gave 62 aspiring young poets a chance to engage with materials offering an intimate glimpse into the working lives of a select group of 20th century poets. Threaded throughout much of the exhibit was a theme of poetry and protest, said Gabrielle Dudley, instruction archivist and QEP (Quality Enhancement Plan) librarian at MARBL, who helped arrange the workshop. Dudley spoke with pleasure about watching participants engage with the materials. “I hope that it can inspire them,” she said. At one table, young poets studied a hand-edited manuscript for Langston Hughes’ “Scottsboro Limited: Four Poems and a Play in Verse,” crafted in response to the infamous example of injustice in the Jim Crow South. At another table, they found envelopes bearing the hastily scribbled beginnings of a poem by author Alice Walker, who also produced poetry throughout her writing career, Dudley noted. One young poet studied the early work of Ireland’s former poet laureate and Nobel Prize winner Seamus Heaney — a poem published in a college literary magazine when he was close in age to many of the Brave New Voices participants. In sharing copies of working poetry drafts, “we’re allowing viewers to step into a private moment with the author," she said. Through special arrangement with Atlanta University Center’s Robert W. Woodruff Library Archives Research Center, archival materials from rapper and poet Tupac Amaru Shakur were also on display – intimate ephemera from a brief, but impassioned life. Seeing pieces from Shakur’s life given greater resonance with the passage of time made Onyirimba rethink his own poetry practices of taking notes and making drafts on a smartphone. The Brave New Voices Festival concluded Saturday, with youth teams from Atlanta, Denver, Fort Worth and Philadelphia facing off in a sold-out Grand Slam Final in the Woodruff Arts Center Symphony Hall. Award-winning poet Jericho Brown, an assistant professor of creative writing at Emory, joined a panel of judges in selecting Team Philadelphia as the top performance.